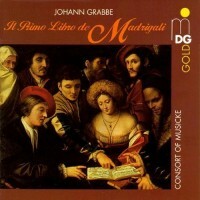 Johann GRABBE: Madrigals (1609). (Rec. 2011.) Weser-Renaissance Bremen, Manfred Cordes (dir.). cpo 777 662-2 (http://www.jpc.de/jpcng/cpo/home). Distributed in the US by Naxos (http://www.naxos.com/). Valuable side issues (notes, translated poems, instrumental pieces), but the singers can’t defeat the confused miking. I feared for my gear. Grabbe’s debut recording. With the Divine Emma on board, the chromaticisms have real bite. The performance and Rooley’s notes make the case. 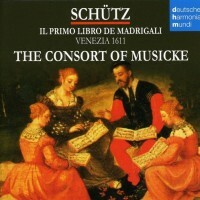 Heinrich SCHÜTZ: Italian Madrigals (1611). (Rec. 1998.) Cantus Cölln, Konrad Junghänel (lute, dir.). Harmonia Mundi HMG 501686 (http://www.harmoniamundi.com/). 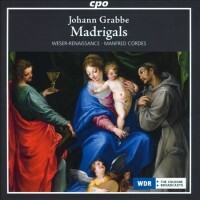 Like the Grabbe, Schütz’s madrigals date from study with G. Gabrieli. Rooley’s is the more beautiful; Junghänel might reward digging deeper. 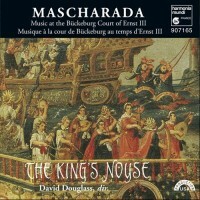 “Mascharada: Music at the Bückeburg Court of Ernst III.” Works by William BRADE, Thomas SIMPSON, Nicolaus BLEYER and Johann GRABBE. (Rec. 1995.) The King’s Noyse, David Douglass (dir.). 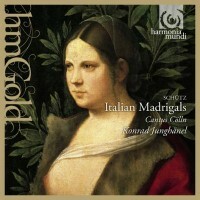 Harmonia Mundi HMU 907165 (http://www.harmoniamundi.com/). Transplanted consort music takes root, with Grabbe’s homegrown efforts by no means inferior. Ernst III died in 1622 and his court disbanded. “17th Century Funeral Music.” Heinrich SCHÜTZ: Musikalische Exequien, SWV 279-281 (1636); Geistliche Chormusik: SWV 378 & 388 (1648). Michael PRAETORIUS: Musae Sioniae VIII, exc. (1610). Johann Hermann SCHEIN: Threnus (1617). Johannes Christoph DEMANTIUS: Threnodia »Quis dabit oculis« (1611). (Rec. 1992-93.) 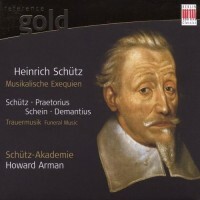 Schütz-Akademie, Howard Arman (dir.). Berlin Classics 0115192BC (http://www.edel.com/audio/labels/home/berlin-classics/). Distributed in the US by Naxos (http://www.naxos.com/). Context is the key. A moving Schein tribute (SWV 388) and the Demantius elevate an Exequien that’s more competent than inspired. Fine notes. Bryston BCD-1 player – Acoustic Revive XLR cables – Schiit Mjolnir headphone amp – Ergo AMT (Heil) headset.